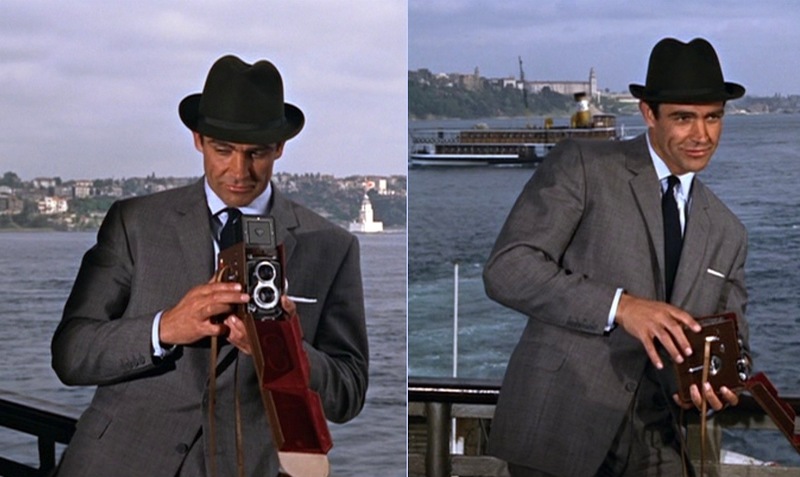 Sean Connery behind the scenes in Turkey during his second outing as James Bond, From Russia With Love, in 1963. 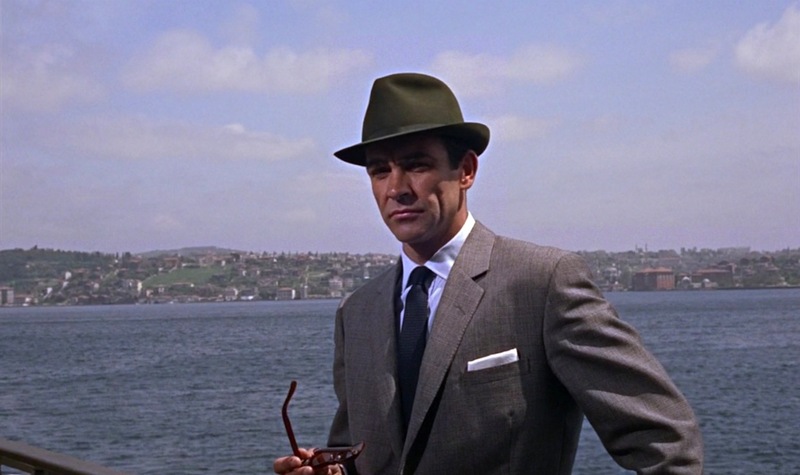 For the 007th of the 7th month of the year, BAMF Style is focusing on James Bond’s 7th suit worn in From Russia With Love, a black and gray Glen plaid check suit. 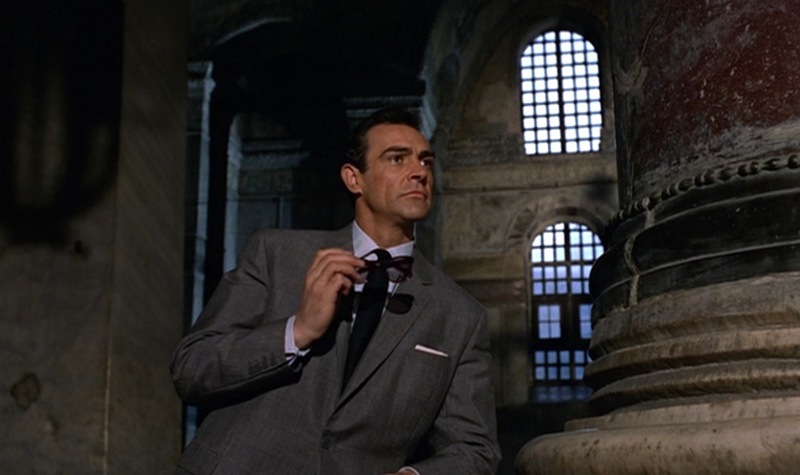 Bond had worn a different Glen Urquhart suit earlier in the film when visiting Kerim Bey in his office, but this suit can be differentiated by details in the tailoring. Kerim: The old game. Give a wolf a taste, then keep him hungry. My friend, she’s got you dangling. Bond: That doesn’t matter. All I want is that Lektor. Kerim: All? Are you sure that’s all you want? 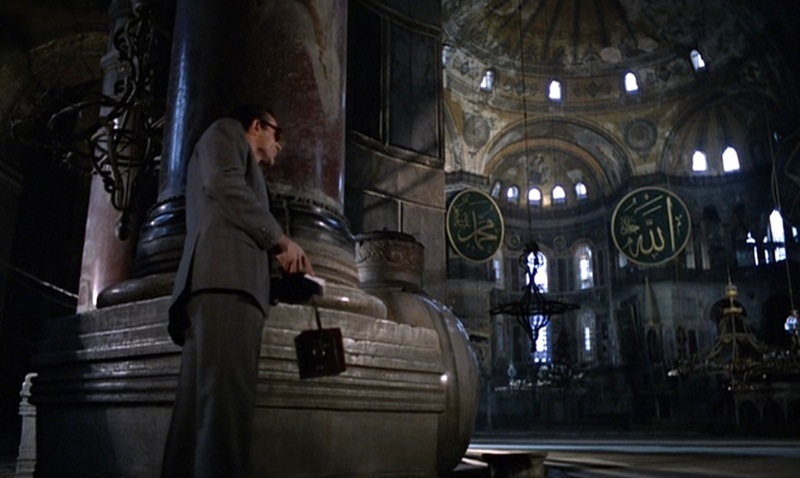 After their first night together in Bond’s hotel room, 007 plans to meet Tania in Istanbul’s legendary Hagia Sophia mosque. 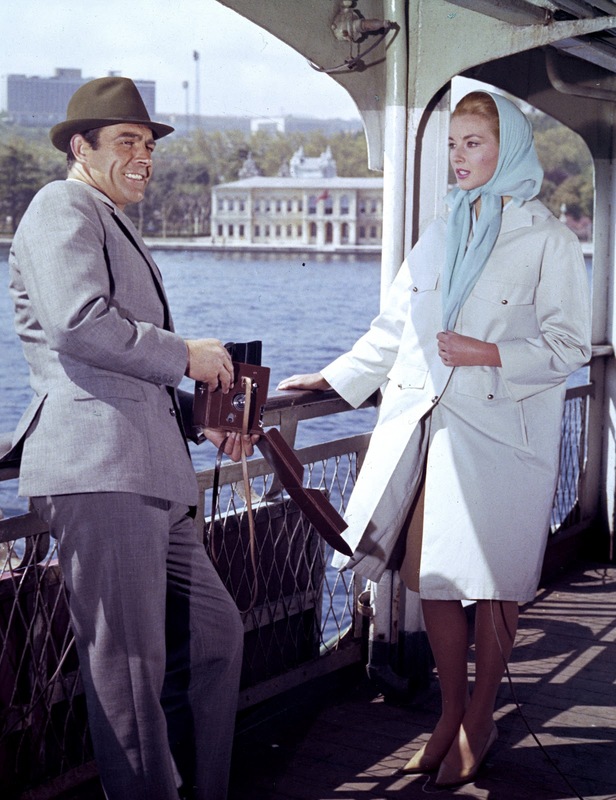 Of the five suits that Bond wears in Istanbul, his lightweight Glen plaid check suit for the visit to the Hagia Sophia and subsequent boat ride on the Bosphorus is one of the more appropriate for the warm surroundings. Matt Spaiser also wrote a good, in-depth analysis of this suit on The Suits of James Bond. This suit has a black and gray check pattern on a lightweight twill material, although this check is finer and the suiting is an even lighter weight than the previous suit. While his choice of a charcoal flannel suit in this climate could be worthy of some criticism, at least he was wise enough to wear it for a chillier night and save this lightweight suit for a sunny day visiting old and un-air-conditioned mosques. Don’t be one of those douchebags who doesn’t know how to wear a hat with a suit. Learn from James Bond. The suit jacket is single-breasted with slim notch lapels, natural shoulders, and roped sleeveheads, like all of Connery’s Bond jackets. Anthony Sinclair’s now legendary “Conduit Cut” is on full display with this subtly elegant suit with a draped chest, front darts, suppressed waist, and slightly flared bottom. The jacket has flapped hip pockets, although the flaps are occasionally tucked into the pockets. The welted breast pocket is embellished with a folded white linen pocket square. Not even Terry Richardson can look this mischievous with a camera in his hand. In addition to the finer check of this suit, differentiation can be found when examining the vents and buttons. The two-button front stance of this suit jacket is slightly higher than the two-button front of his Glen Urquhart suit coat; the buttons here are also a lighter shade of gray. This suit also has a single back vent while the earlier suit has double vents. Try to look this cool the next time you’re in a church. The trousers do not get much screen time since Connery keeps his jacket buttoned throughout the sequence, but the glimpses we do get reveal the usual high rise, double forward pleats, slanted side pockets, and cuffed bottoms. Plus, I’d bet dollars to donuts (although donuts are worth like $3 now) that the trousers have button-tab “Daks top” side adjusters. Bond’s shoes are his usual pair of black leather plain toe 3-eyelet derbies with dark gray socks that continue the leg line from trouser into shoes. 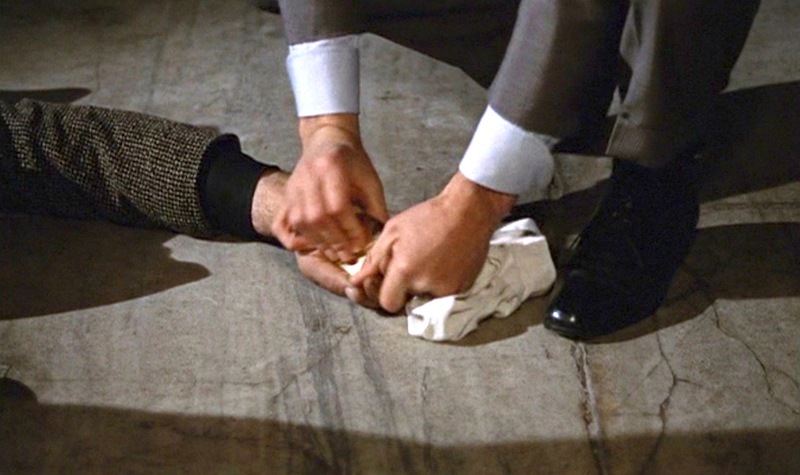 Bond takes some evidence from a very dead fellow spy. Bond’s choice of a pale blue Turnbull & Asser dress shirt with a front placket, spread collar, and 2-button turnback cuffs should come as a surprise to no one, especially since it is paired with a dark navy blue grenadine tie. 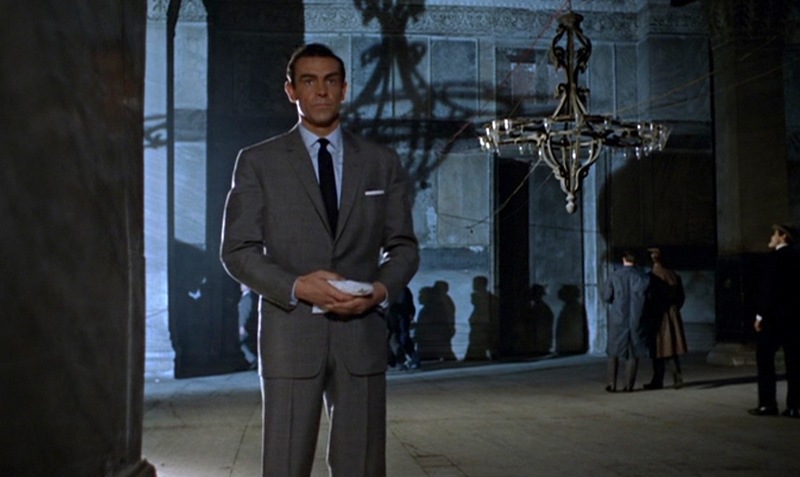 While some people might find Bond’s pattern of gray suit, pale blue shirt, and dark blue grenadine tie boring, I personally think it is a testament to the simple elegance of Anthony Sinclair’s distinctively English tailoring that Connery manages to make such a limited color palette look good over the course of five or six films and nearly ten years. Although there are always some variations in the details, Connery’s Bond established a look early on and managed to maintain it without looking dated. Connery nailed the gray suit, light shirt, and blue tie look. Roger Moore is unfairly remembered by some as the “leisure suit” Bond likely because his 007 never had a defined appearance. Even in a single film, Moore could be wearing earth tones in one scene, a double-breasted gray pinstripe suit in the next, followed by a navy blazer and flared trousers. 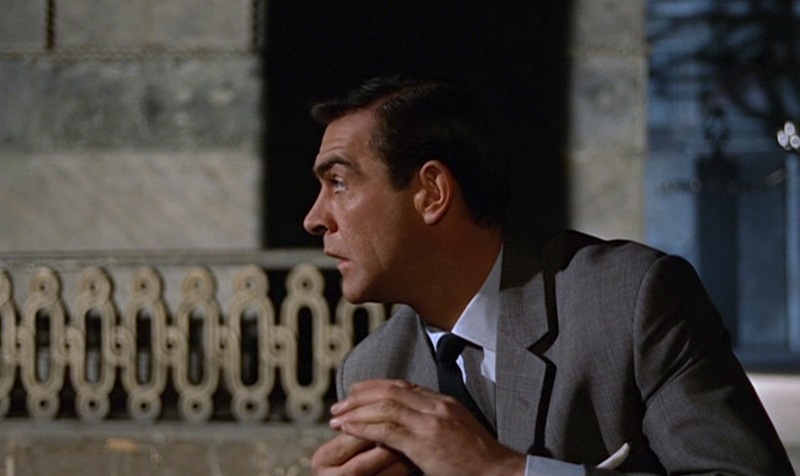 While one could blame the changing era (1973 to 1985), a shift in time doesn’t necessitate deviation from a certain theme as Matt Spaiser so excellently noted when comparing Connery’s suits from 1962 to 1971 in Dr. No and Diamonds are Forever. This is the one of the most accessorized looks we get from early Connery. 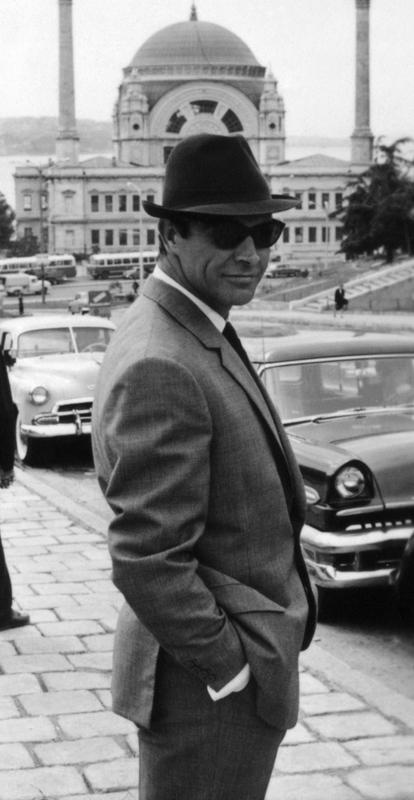 Although not wearing his signature Rolex wristwatch, Bond is sporting hat, holster, and sunglasses, marking one of the few – if not the only – pre-Brosnan appearances of sunglasses with a suit. 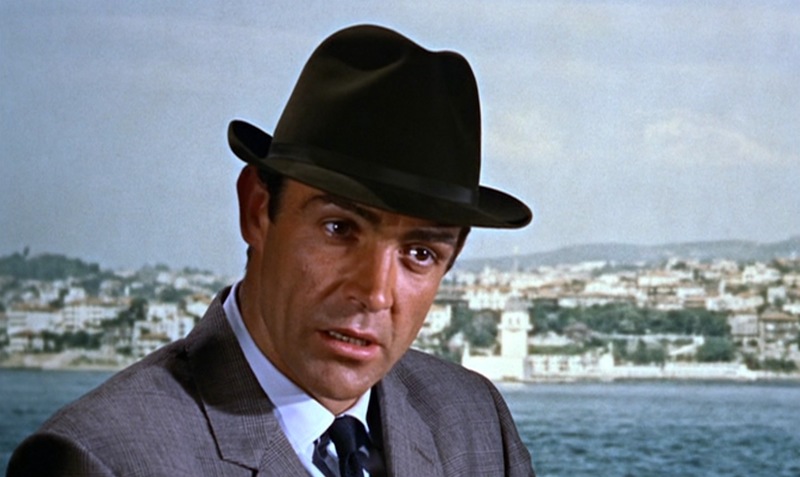 Bond’s hat is his usual dark olive brown felt trilby from Lock & Co. Hatters of London, which got more screen appearances on Moneypenny’s hat hook than actually on Bond’s head. The trilby has a narrow grosgrain band – also dark brown – and has a slightly tapered pinched crown. A Lock & Co. Hatters “Sandown” trilby like Bond’s is still available from the St. James Street store in London. More information about the hat is available from James Bond Lifestyle, which also tells us that St. James Street also houses the Swaine Adeney Brigg store that provided Bond’s handy attaché case in the flick. 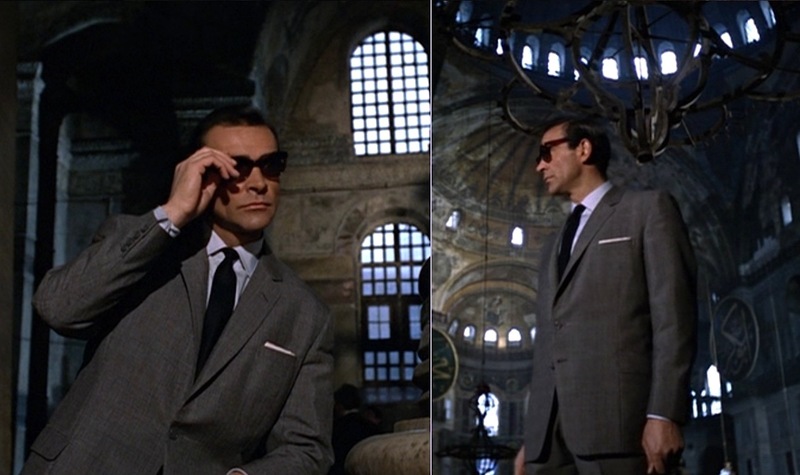 The first time we see James Bond wearing sunglasses is when he struts into Hagia Sophia and whips off a pair of dark tortoiseshell plastic-framed wayfarer-style sunglasses. The Bond tour of Istanbul begins at Hagia Sophia, an imperial mosque that went through periods of service with the Eastern Orthodox and Roman Catholic religions as a cathedral before conversion to a museum in 1935. The cathedral was built from 532 to 537 AD and was the focal point of the Eastern Orthodox Church for nearly a thousand years, witnessing the start of the Great Schism in 1054 with the excommunication of Michael I Cerularius by Pope Leo IX. Bond tends to opt for self tours rather than guided group tours. 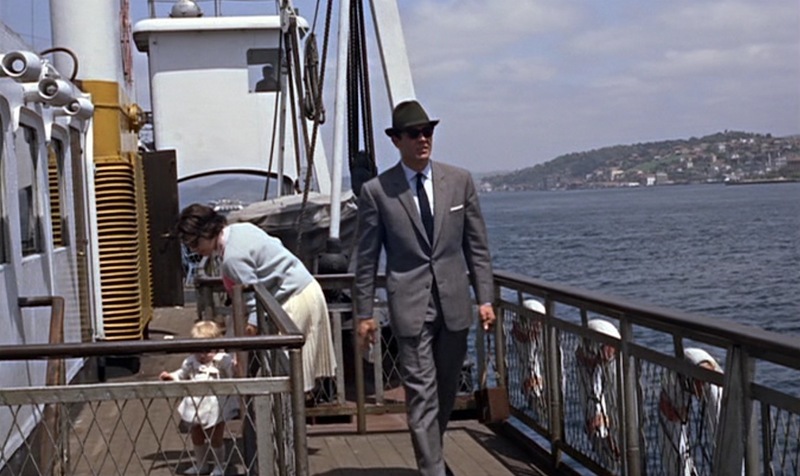 Bond’s next meeting with Tania is on a ferry crossing the Bosphorus. Although it wasn’t around at the time of filming in mid-1963, the Bosphorus Bridge was built in the early 1970s to connect the European and Asian sections of Istanbul on either side of the Bosphorus. At 5,118 feet long, the bridge was the fourth longest suspension bridge span in the world upon its completion and the longest overall outside the U.S.
Leave the tacky Hawaiian shirts at home and opt for a lightweight suit and sunglasses. Connery’s Bond offers a timeless look for appropriate for both globetrotting and international intrigue. Iconic Alternatives has a great rundown of affordable options to channel elements of this, such as his sunglasses, and many other 007 outfits. Tania: The mechanism is… Oh James, James… Will you make love to me all the time in England? Matt Spaiser also wrote a post about this suit on his excellent blog The Suits of James Bond.